Author joeldermolePosted on November 30, 2017 Tags polarization, politicsLeave a comment on The lesser of two evils is still evil, right? Author joeldermolePosted on October 26, 2017 Tags donald trump, george w. bush, mennonites, politicsLeave a comment on In politics: Purity, pragmatism, or something else? I saw this picture over the weekend at the Nelson-Atkins art museum in Kansas City, Mo. (It’s a terrific institution, by the way.) It was part of a broader exhibit highlighting the Depression-era work of Lange and other photographers, Walker Evans, Arthur Rothstein, Marion Post Wolcott and Peter Sekaer. It was stunning. It was, in fact, difficult emotional work. One of these photos is a powerful document. Dozens of them tell a story, immerse you, make it difficult to leave these lives in the past. Oh, how we hate poor people in this country. • These pictures were taken all within the lifetimes of my grandparents. It’s both forever ago and just that close. The conditions that millions of Americans were living in — in makeshift shacks, built from mud or items rummaged from the trash, or simply not having enough to eat an being required to flee across the country in hopes they’d find some way to make a living — are those we associate, in modern America, with “third world countries or with pre-modern ways of living in our own. Truth is: What we think of us civilization — of a largely middle-class society, anyway — is both recent and fragile. • This may be a weird response, but these photographs made me angrier yet about McCarthyism. If you were a person surviving the 1930s, bearing witness to what was going on around you — but not privy, at this point, to the destruction of Russian life under Stalin — it seems really easy me to see why a black person or a poor person in that era might’ve embraced, for a time, Communism. It makes all the sense in the world! To be judged for such conclusions by Cold Warriors — to lose or risk losing one’s livelihood in the 1950s because one got tired of all the poverty and oppression in the 1930s — is just … ugly. • Finally, I’m reminded of the importance of bearing witness. To see what’s going on around you is difficult, sometimes. To document it — honestly and unflinchingly — is to increase the potential for a healthy response. God bless the people who do such work. The “Dignity and Despair” exhibition runs through Nov. 26. Anybody in the Kansas City area between now and then would do well to see it for themselves. I’ve got a story to tell, one that’s out there on the public record, but one that hasn’t been much remarked upon. He lied. Did American democracy die? It takes place during the Obama-Romney campaign of 2012. During the campaign, Mitt Romney was proving reluctant — as Donald Trump was, after him — to release some pertinent personal financial information. So Sen. Harry Reid, then the leader of Democrats in the Senate, decided to make a big deal about it. Why? Because there’s absolutely no reason to believe that Reid is telling the truth. He’s offered no witnesses and no proof of his claims, only a “somebody told me” statement that wouldn’t get within a million miles of passing muster in a court of law. And when challenged to present his evidence, his response is that Romney can prove Reid’s allegations wrong—by releasing his tax forms. Politically clever? Yes. Distasteful? It absolutely should be. Fast forward to the fall of 2016. Trump versus Clinton. Her emails have been hacked; Trump has asked the Russians to release them to the media. It’s all very suspicious. And Harry Reid, serving out his final days in the Senate, makes his move. He writes an angry letter to James Comey. Here’s the thing: Reid was right! He was telling the truth! We found out later that Republicans had warned President Obama they’d accuse him of politicizing intelligence if he went public with this — and Obama, probably figuring Clinton would win anyway, decided to keep his mouth shut. Reid’s letter to Comey, when made public, represented one of the best possible chances to get this issue fixed firmly in the minds of the American voters. Reid is saying that he has been told the FBI has evidence of possible collusion between the Trump campaign and the Russian government. And he’s not just saying this information came from mysterious and unnamed national security officials; he’s saying Comey himself has left him with this impression. It was, in retrospect, a missed opportunity. In 2012, when Reid made his first, pretty clearly bogus charges, there were no end of defenders. Why? Because, I was told, Romney hadn’t released his tax returns so who was to say Reid was wrong? And in any case, the other guys fight dirty so why shouldn’t we? We’re tired of always being the weak ones, right? The problem being: When Reid’s credibility mattered most, when he could’ve used some “trust me” to help steer the nation on a different course, he’d spent it all on a crappy lie he probably didn’t even need to make in order for Obama to win. Going low, politically, has its short-term rewards. It can be justified on that basis. But who wishes Americans had paid more attention to Harry Reid last fall? A lot of the same people who lauded his earlier lie. Hey: Politics ain’t beanbag. It’s never going to be as clean as I like it. But there are costs to wallowing in the dirt, and they’re not just moral prissyness. They matter. We’re all living with how they matter now. Years ago, I was visiting the home of a politically conservative couple in rural Kansas. They were a generation older than me and very gracious hosts. We were on the patio, eating dinner, when the wife suddenly picked up a fly swatter and used it to smash a box elder that had landed on her chair. “Damn Democrat,” she muttered as she shook its guts into a nearby planter. 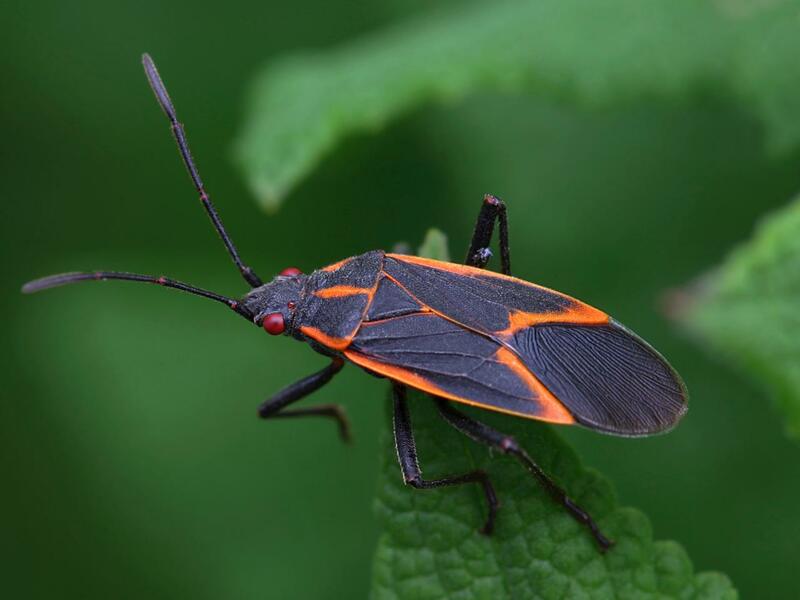 I’d never heard the term before (maybe you, a native Kansan, have), but apparently the term is used in the central states for these bugs, which appear around the time of the national political conventions. (This may be the only time I get to use my limited knowledge of etymology and entomology in the same sentence!) But the glee with which my host smashed that bug, then swore at it, let me know that she very much enjoyed thinking about members of the opposing political party as detestable, destructive objects that she could kill. Above, a box elder bug. What happens when we use metaphors that show contempt for people with differing political views? When are such metaphors funny or useful? When do they shape our feelings about actual people? I tried not to give that moment too much credibility, but I replayed it many times in my mind since, especially since the 2016 primary season. Around that time, I began a side project following “Deplorable” Facebook pages, pro-Trump social media spaces that, in the words of one, are for anyone who has been accused of having an “-ism” (racism, sexism, nativism, etc.). The total disrespect that members of these boards have for others (including other members who sometimes ask them to stop with the most violently racist and sexist memes) seemed another version of smashing of the box elder bug. And your comments earlier this week, about our race to the bottom, our movement from tribalization to demonization to the Russia scandal, reminded me of it again. You argued that both Democrats and Republicans get tribal and demonize each other. Consequently, we justify whatever means we can use because, after all, the “other guy” is going to do it too. Eventually, we’ll be left only with politicians willing to always do the worst. This isn’t leadership; it’s a fear-based strategy to get and keep power, which really only becomes about keeping others out of power. It’s a game of controlling the ball but never moving it forward, just as GOP leadership has done in these first 100+ days of the Trump administration. Did voters get what they deserved in the 2016 election? Until the shadow of Russian interference in the election is gone, we won’t know. At minimum, though, it was clear in the primary line-up that we didn’t care enough about character to support candidates who were competent and had the character both to serve and to lead a divided nation forward toward a more perfect democracy. Can we get there? Yes. You asked, though, how. How do we go high when they go low, whatever our party affiliation and whoever we see as the “they”? I think we have to punish politicians who lack character by voting them out of office and calling them out when, during their tenure, they fail to live up to basic standards of civility and decency. That also means, though, that we need better options–which means more people of character stepping up to serve in elected roles, which means lowering the financial barriers to running. We can also improve civics education, making public service integral to civil life, so that the question “How do I serve?” is one everyone asks. Author RebeccaPosted on July 19, 2017 July 19, 2017 Tags civic education, civics, hate, politics, rhetoric, Trump5 Comments on How to Go High? I’ve been thinking about this awful tweet from the awful Dennis Prager. And I’m a bit discouraged. Let me preface: I’m not quite a “pox on both your houses guy.” All things being equal, I find liberalism superior to conservatism, and I don’t make apologies for it. But I do think political tribalism blinds us to the ways that we’re very similar to our rivals, and that awareness of those similarities is a hedge against hubris. Best I can tell, both sides believe it. Best I can tell, neither side really examines why the other side thinks that. Everybody has their reasons, I assure you, and it’ll probably be worth examining that in another post. But one result of our ongoing demonization is this: It removes any moral or ethical barriers we might otherwise observe. The only object is to win — or avoid losing — by any means necessary. The other guys are going to do it. We should too! All of which makes the race to the bottom a self-fulfilling prophecy. Meeting with the Russians? In a way, that’s not a transgression of the norms, but a fulfillment of what the norms have become. How to disrupt that race? No idea. Ugh.